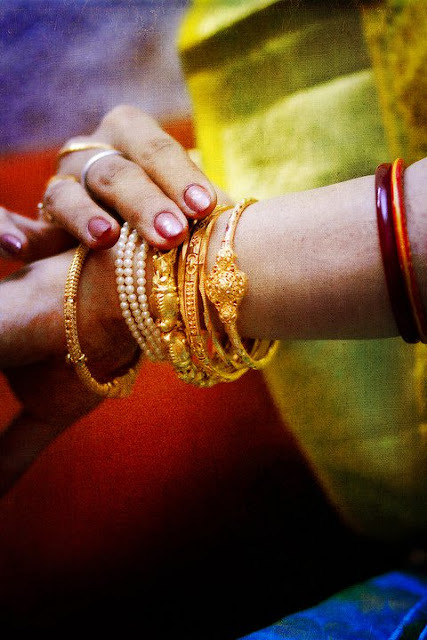 Bangles are traditional ornaments worn by South Asian Women primarily in India, Pakistan and Bangladesh. Women start wearing them on their wrists at a very young age and some wear them all the time. These are usually made of Gold, Silver, Glass, Ivory, Metal among others and come in a Kaleidoscope of designs and colours. Cities across India have Bangle markets, but several novelty shops across towns stock them. There are plenty of interesting trivia associated with bangles; the most peculiar one’s being that women are not supposed to buy the bangles that they would wear. It is also considered inauspicious for a married woman to have bare wrists.